Fr. Mark Henninger, SJ is a chaplain at Loyola University Hospital in Maywood, IL and a campus minister for the medical and nursing schools. 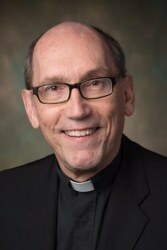 His training in spiritual direction includes an internship at Loyola University’s Institute of Pastoral Studies. For many years he was a professor of medieval philosophy, most recently at Georgetown University in Washington, DC, but with prior positions at Loyola University in Chicago, University of Detroit Mercy, the Gregorian University in Rome, and Arrupe College in Zimbabwe.